It’s show week here in Orkney. It’s been a rubbish year so far farming-wise, and a couple of the shows have had to be cancelled due to water-logged showparks and beasts barely out of their byres. However, the weather gods eased off on the proto-winter stuff for the Dounby (properly the West Mainland) Show today; at 8.00am it was overcast and drizzling, but by lunchtime it had cleared up and the sun had come out, ready for the parade of champions. Opinion was expressed that it was a good turnout, everything considered. The Thursday of Dounby Show day is a local holiday here, and the highlight of the social calendar for many farmers and their families. Two days later comes the culmination of the week, the County Show – usually attended by 10,000 plus people, nearly half the population of Orkney. The bigger shows, such as the Dounby and the County have fairgrounds, where young Orcadians can learn how to get rat-*rsed on cider and then throw up on their friends after a go on the waltzers. In years to come they will grow up to climb on new combine harvesters: thus traditions continue through the generations. The shows also have many more stalls, selling anything from inflatable spidermen to steak sandwiches, alongside tables fund-raising on behalf of Cats Protection, the RNLI and Orkney Archaeological Society. However. Much as I enjoy the agricultural side of the shows……..the true glory, the jaw-dropping wonders, the inspirational pinnacles of rural achievement are, I believe, to be found in the Flower & Produce/Horticultural/Industrial shows which run alongside the coo stuff in a local school, church hall or community centre. In times gone by the skills of the farmers’ wives would provide the family with meals made from the farm produce. Preserves would take care of the fruit; cakes and pies would ensure that a hungry working man had a piece for out in the field, dried herbs could be used in cooking during the winter months. Yarn too was put to good use – the shorn wool was spun by hand and knitted or woven into garments for the family. The home would be made jolly with decorative handcrafts and bunches of wild flowers. If you took pride in your abilities, and wanted to show the other farmers’ wives what you could do, and demonstrate skills to the young folk, what better platform could there be than the indoor event which ran alongside the one with the livestock? Thus we have the fabulous produce/industrial shows. 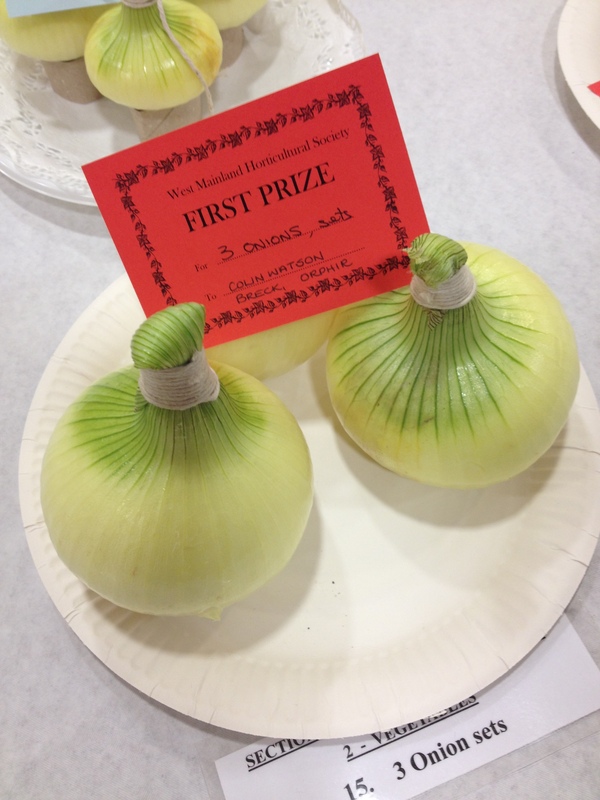 A year or two back I attended the County Horticultural Show in Kirkwall, and I was a bit disappointed. It was mostly minimal artistic flower arrangements, and a few ropey-looking runner beans. 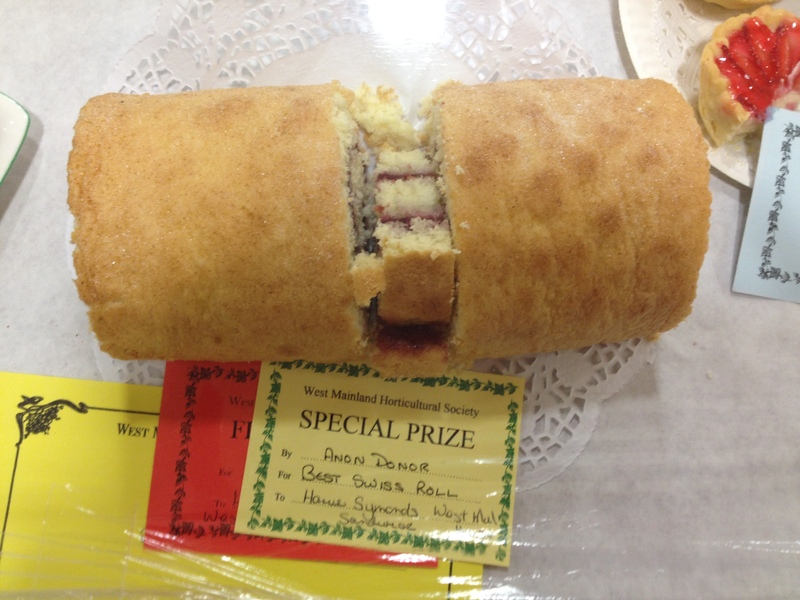 Turns out that the County do is a paltry affair, and the very best exhibits are held back for the more local shows like the Dounby Show. For the first time ever, I got my act together to enter something (after 12 years of muttering ‘I could do that’); 10 green gooseberries on a plate, and a jar of blackcurrant jam. In preparation I bought a bonny plate (Clan charity shop, 50p), even though the schedule stipulated that they were not judging the berries on presentation. Having complete the paperwork (sealed envelopes, class and category clearly stated etc) I dispatched Mr Dragon at the appointed hour to take our produce to the Dounby Community Centre. 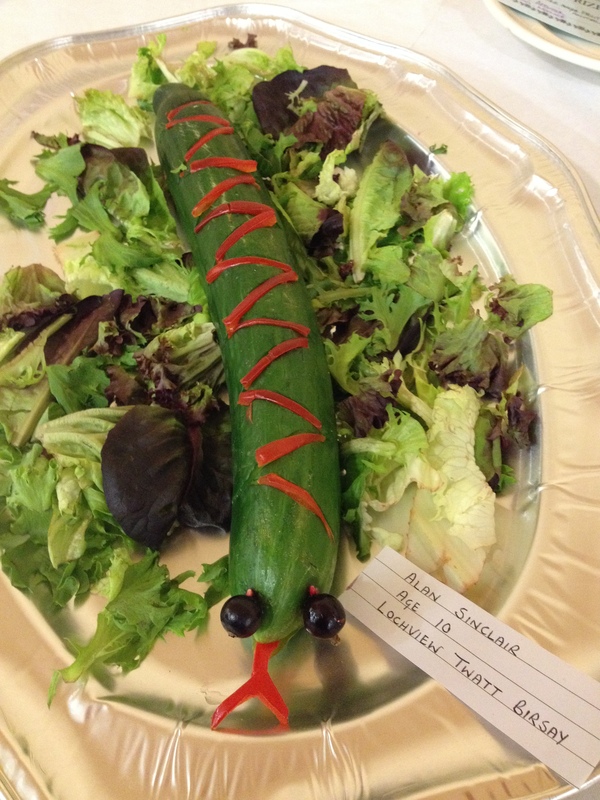 The report came back about the competition: ‘other goosegogs look like peas but nicely presented on leaves’. The event was officially opened by a local worthy (a church minister who sang a comic song), and the good folk of the West Mainland flocked into the hall to see what had been baked, grown, preserved, knitted, fermented, displayed and photographed this year. First up, the cakes. 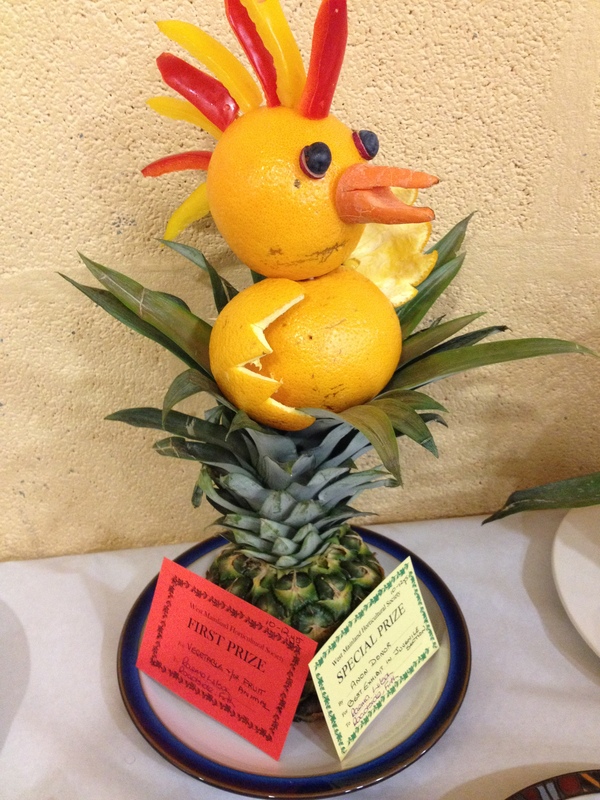 Did you know there are rules for entry to the cake competitions? They have to be in circular tins, for a start (well, the Dounby ones did). The scones have to be no more than 12cm in diameter. But the most astounding thing is this……they have to follow the SAME RECIPE. Now I know many of you will be raising your eyes heavenwards and thinking ‘well obviously’. But this was news to me. No scouring recipe books for that perfect Victoria Sponge. No phoning auntie Beryl for secret ingredients tips. You have to purchase the Schedule some time before, and use only the ingredients listed for each cake. Some folk practice like mad, apparently – I suppose their nearest and dearest get the benefit. I wonder what would happen if you sneaked in an extra egg? D’you think they can tell? We had a healthy debate about whether the cakes were actually eaten – my mother claims that down her way, the judges take a small sample from the underside of the cake to taste, and leave the top looking its best. For smaller cakes, we thought perhaps they make 6, and 1 gets eaten. 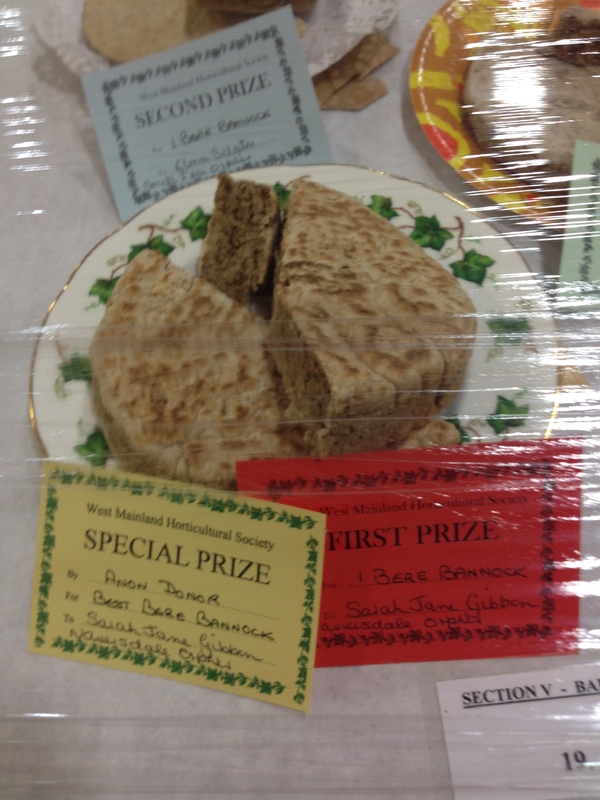 I suspect it will be many years before I feel confident enough to attempt anything like a sultana loaf or an oven scone for a show. The baking section gets bigger every year, it seems to me. Everything from coconut ice to bere bannocks, strawberry tarts to shortbread rounds, oatcakes to gypsy creams. Nowadays the tables of goodies are covered in a protective film but I’m sure that back in the days of yore they were uncovered and at the mercy of every poking finger and explosive sneeze. 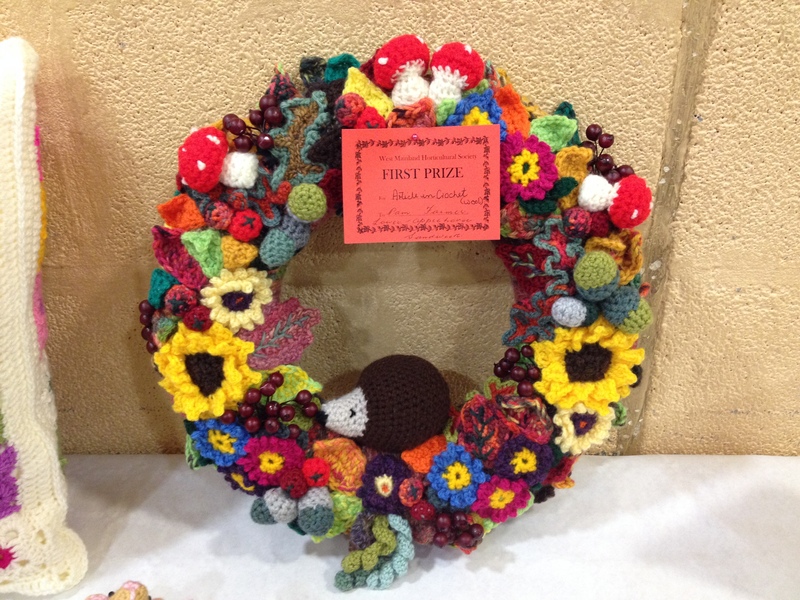 I could weep with a sense of inadequacy when I see the handicraft sections – these exhibitors have been knitting and crocheting and appliquéing for decades and by golly it shows. 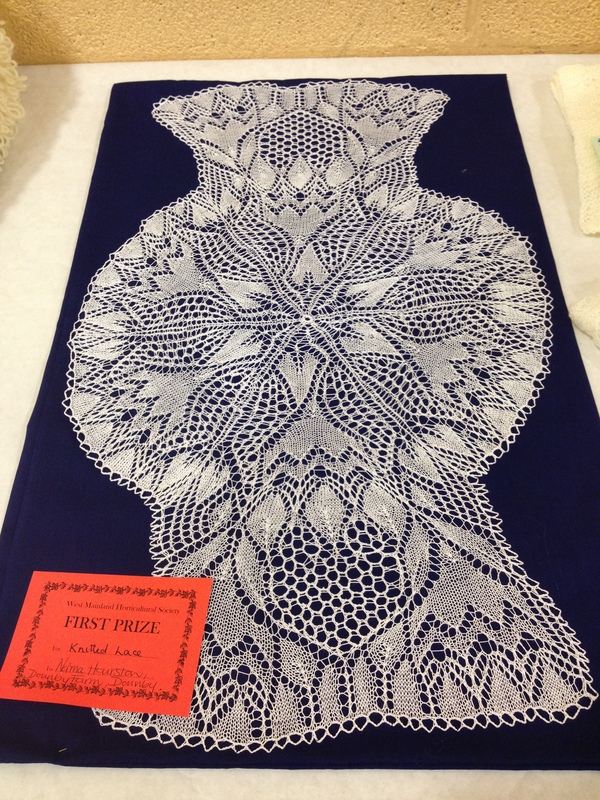 Star items for me this year were the gorgeous embroidered cloak and the knitted lace. Then there’s the fruit and veg. Get a saucer. Put some shredded blue tissue paper in the middle. Surround the paper with 20 firm, plump redcurants. Sit back and reap the admiration of your peers and the judges. Or, find a handy wicker basket and, channelling Bert Fry and Jo Grundy, fill it with your finest cabbages and let a shaft of late afternoon sunlight play on the fresh green leaves. 2015 has been a poor year for the fruit and veg though, and even those with polytunnels or greenhouses have struggled to grow much worth the name. And yet here were shallots, lettuces, parsnips, all looking plump and fresh. The most pleasure, I think, is to be had from the children’s sections. They have the best categories, the funniest entries, and the most imagination. I am delighted to see the return of the handwriting competitions, especially when the subject is a poem of the writer’s choosing. 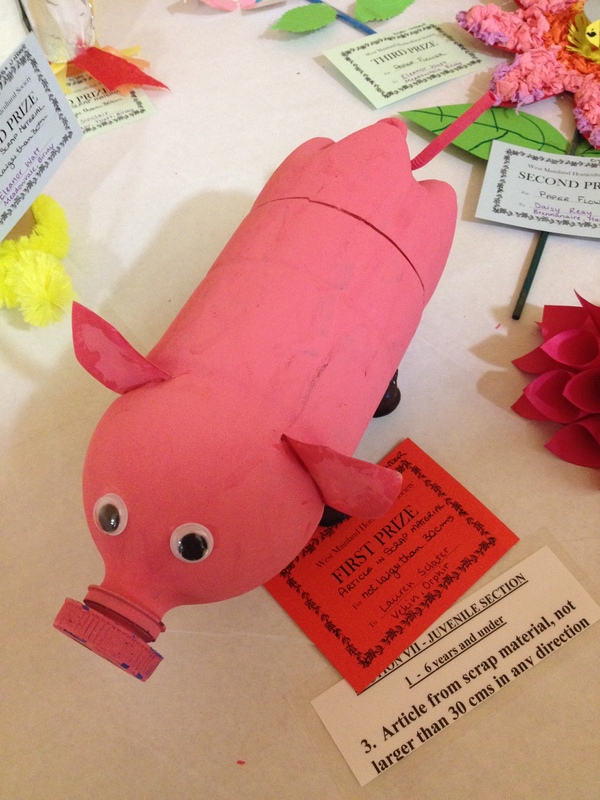 I’m a fan of all the recycled items, the floral arrangement in a toy (this year’s entries included a beautiful posy in a plastic slurry spreader) and the decorated chocolate digestive. 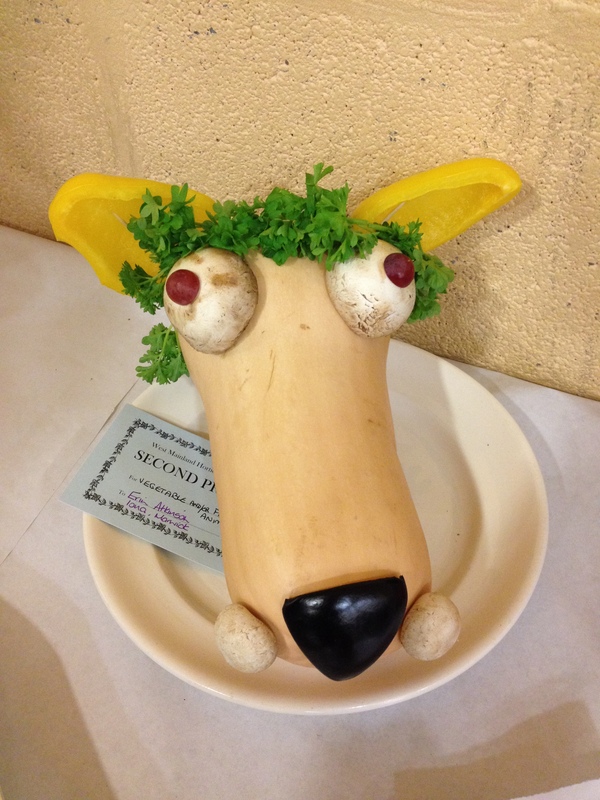 And best of all – the vegetable animals. They always bring a huge smile to my face – this year was no exception. Moving away from the children’s section again, I must give a special mention to our neighbour Skip, who makes exquisite scale models of Orkney buildings. 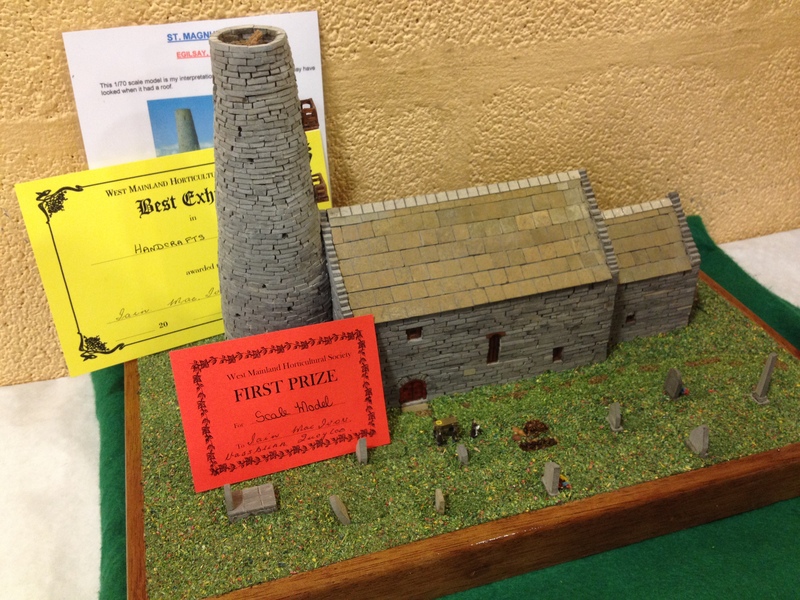 His entry (and worthy prizewinner) this year was a stone-and-slate model of St Magnus Church in Egilsay, complete with tiny funeral in progress; mourners, coffin, flowers, and open grave. So now comes the moment of truth. Were the Dragon’s entries laughed out of the hall, or did they sweep all before them? 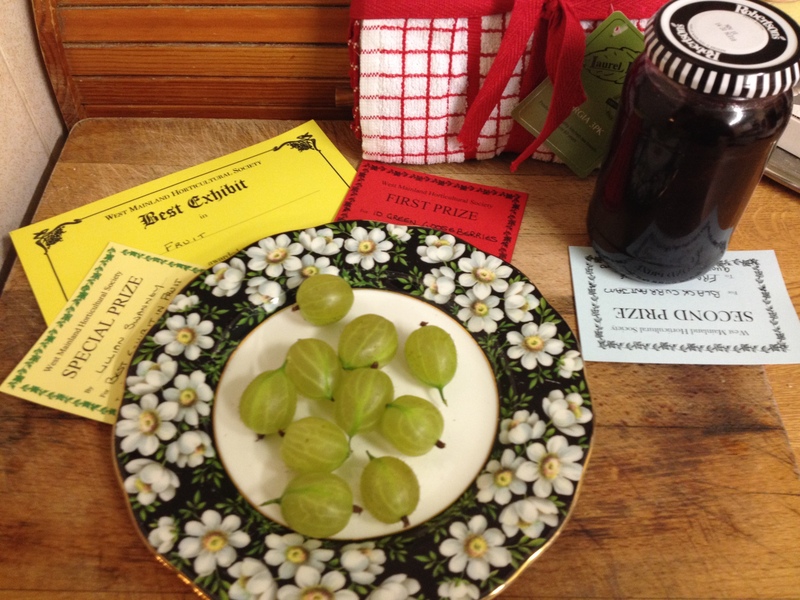 Well……I got a Second Prize for my blackcurrant jam, and I was hugely pleased with that. 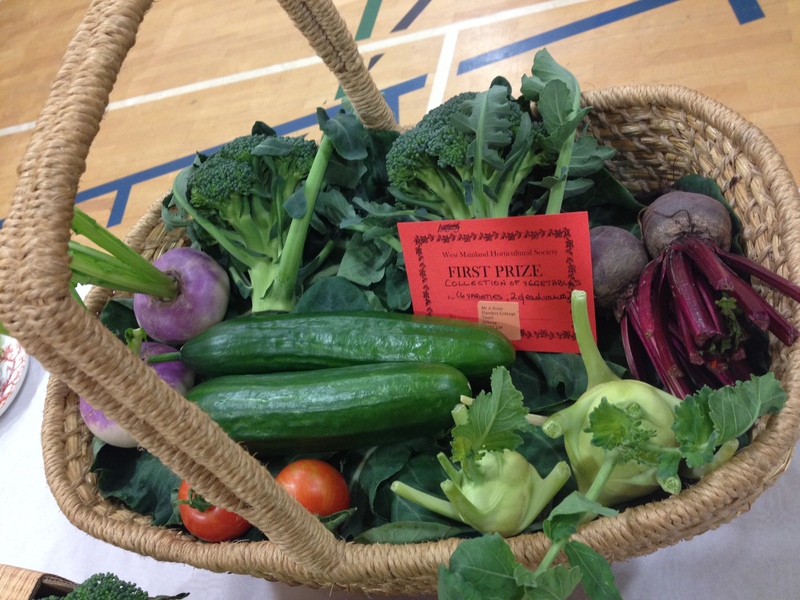 But as we moved on from the preserves table to the fruit and veg section, two brightly-coloured cards caught my eye….a red one saying First Prize to Stromness Dragon for 10 green gooseberries! 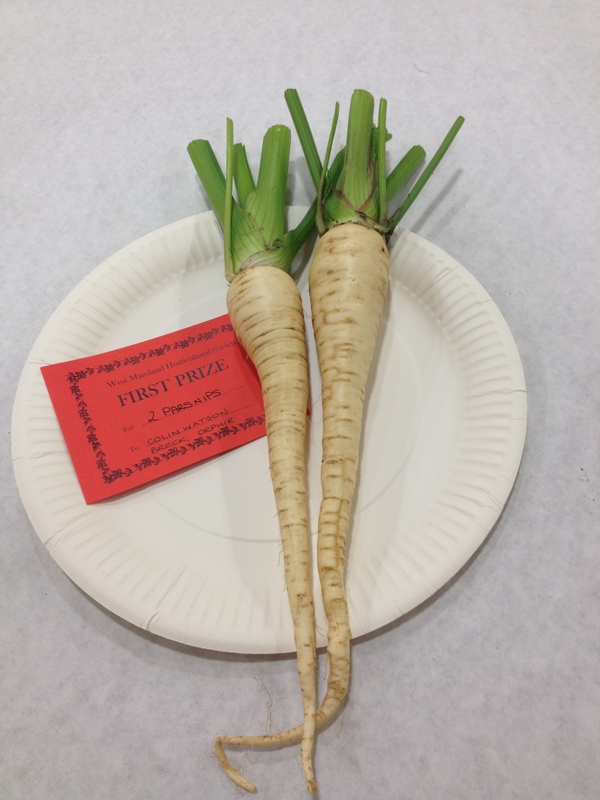 And even better, a yellow card declaring that they were the Best Exhibit in Fruit!!! Mr Dragon claims that he has done most of the soft fruit maintenance this year (ie weeding a bit and throwing a net over them). Fair enough, says I, but it was me who bought a bonny plate and actually bothered to enter them. So we have agreed to share the winnings, which comprise a bundle of tea towels and (I have only just discovered) a small cash prize. As the sun sets on the 117th annual Dounby Show, the farmers of the West Mainland are enjoying a drink, having taken their animals home. I am heading for bed too, my winning certificate proudly displayed in the kitchen. I’ve taken the first step, with some success – so next year we will try our luck with wine, cordial, eggs, scones, rhubarb jam….there will be no stopping us!